This pozole is so good that it doesn’t even need meat and it is a very good news for the vegetarians because they already have the opportunity of enjoying a good pozole. Although almost all the pozoles are made with meat to make the transition towards the vegetarian world mushrooms are used as magic ingredient , same as in the vegetarian ceviche. This dish consists of a soup , which has as main ingredients cacahuazintle maize and mushrooms. These ingredients are immersed in a red broth which flavor is a little spicy and condimented. But that’s not all, the best part is that on the table are put a lot of ingredients so everybody can keep on preparing the pozole to their taste. A very similar concept to that of the tortilla soup. 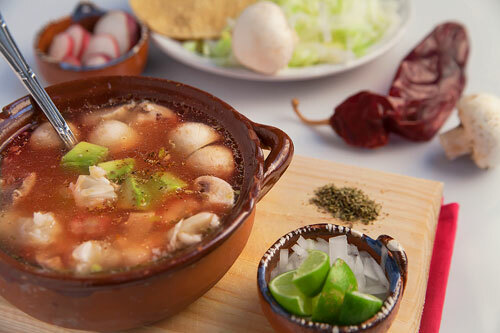 – Although the pozole is a soup, in Mexico is served as main course since it is very abundant and after a good pozole it is not possible to keep on eating... well may be you will have space for a dessert. For this recipe many ingredients are needed. But don’t get frighten about seeing many ingredients, the recipe is easy to prepare but it is a lot of work. The pozole is prepared with cacahuazintle maize and by no means use another type of maize because your pozole won’t have a good flavor. If the white hominy, that is used in this recipe, is not precooked you will have to follow these steps. It is very important to get ramekins because many ingredients will be put on the table. The preparation time is of 1 hour 15 minutes . Put in a colander 17.6 oz of precooked white hominy and rinse it. Transfer from the colander to a saucepan the precooked white hominy that was rinsed. When it boils reduce to medium heat, cover the saucepan and leave the ingredients cooking for approximately 1 hour, until the white hominy is well cooked. Make sure that all the ingredients are always covered with water because it will consume. If scum accumulates on the surface remove it. Remove the seeds of 2 ancho peppers and 5 guajillo peppers. The 5 Guajillo Peppers with the ones you worked. When the salsa boils reduce to medium heat and cook it for about 5 minutes, until it thickens a little and acquires a more intense color; stir occasionally. Then set aside. Clean 17.6 oz of mushrooms. Cut into small chunks the mushrooms that were cleaned; then set aside. Add in the frying pan the small mushroom chunks that were cut and fry them for about 2 minutes, until they are lightly fried; stir regularly. Then set aside. Put in a ramekin 2 tablespoons of oregano, then set aside. Cut 3 limes into wedges and put them in another ramekin, then set aside. Slice 3 radishes and pass them to another ramekin, then set aside. Cut 1/4 of a lettuce into strips and put them in another ramekin, then set aside. Finely chop 1/2 onion (2.4 oz) and pass it to another ramekin. Verify that the white hominy that was left cooking is well cooked it must be soft, puffed and broken; if not cook it for a longer time. Strain the Red Salsa that was cooked. The Mushrooms that were fried. Mix all the saucepan ingredients and bring the broth to a boil over high heat. When the broth boils reduce to low heat, cover the saucepan and leave the vegetarian red pozole cooking for 10 minutes, so the flavors mix. Recommendation: Prepare some refried beans , put them on tostadas and accompany them with the pozole. Variation: Would you like to try the green version of this pozole? Did you like the Red Pozole? This is the maize that can be used to make your pozole. Although this pozole hominy is not in a precooked state, therefore you will have to do some previous steps before preparing the pozole. The pozole without oregano is really not pozole. You have to put oregano to the pozole and there is no excuse because you can buy the oregano here – and the best is that it is organic. The ancho pepper is an important part of this pozole salsa and you really have to use it. If you cannot find it you can buy it here.